These are, no joke, the best gluten free rolls I’ve ever had. They happen to be dairy and egg free, too, so they’re great to make when you’re out of those ingredients or if you avoid those ingredients in your diet. I’m so excited to share this recipe for the fluffiest gluten, dairy, and egg free dinner rolls! More and more people are contacting me to tell me about their new found allergies or intolerances to dairy, gluten, and eggs. Interestingly enough, a lot of young babies don’t tolerate those ingredients well, and many of my breastfeeding friends have had to eliminate them from their diet. It’s possible that dairy, gluten, and/or eggs are to blame. Of course, always seek professional care and advice. Just be aware that taking out dairy, gluten, and eggs could change things dramatically for you or your baby if you’re experiencing any of the above symptoms. It’s at least worth a shot (AFTER consulting a medical professional!). Disclaimer: This post contains affiliate links. I may earn a small commission if you make a purchase, but you will not be charged a penny extra! And mama, I never recommend products I don’t love or believe in. I so appreciate your support. My whole family struggles with allergies, so we’ve done multiple elimination diets and have needed to avoid all of these ingredients at certain points. Because of needing to cook without eggs, dairy, and gluten at various times, I know how difficult it can be to find or make delicious bread when you can’t (or choose not to) consume those things! But here’s some hope. Some fluffy-bread-you-can-eat hope. These vegan, gluten free rolls are super good, easy to make, and only have one rise. You’ll never know they’re missing gluten, dairy and eggs…except for the fact that, well, you made them…so you do. But other people won’t know unless you tell them! 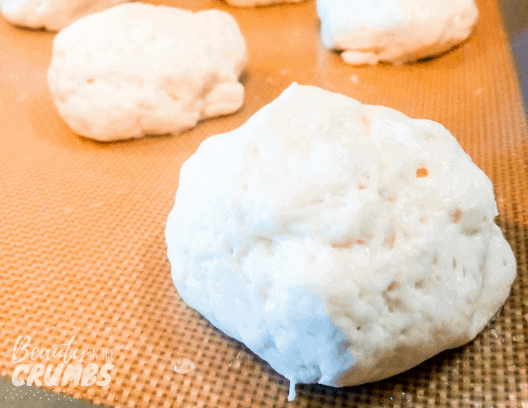 This gluten free roll dough is very sticky! To shape it into rolls, you’ll want to work with wet hands. I usually have a bowl of water that I dip my hands into on my counter as I work. You’ll want to re-wet your hands before shaping every roll. You’ll want to handle the rolls very gently. Try not to squeeze them, but rather smooth them quickly like you’re playing a weird game of hot-potato. Hop on over to see the list of kitchen appliancesthat will make your gluten-free life so much easier! The absolute best gluten free dinner roll I've ever had! These also happen to be egg and dairy free, so they're vegan friendly. Bake in the preheated oven for 25-28 minutes, until internal temperature in around 200 degrees F.